Amazing experience! This was my first solo vacation, and I was a little hesitant booking the trip when I had never surfed, didn’t know any one else, and was staying in the dorm room. 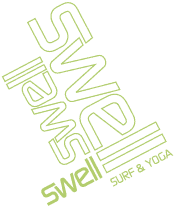 My initial concerns vanished upon arriving at Swell, and I’m so glad I just booked it. I met a variety of fantastic people and miss them already! The camp is set up in a way that is naturally very social and relaxing, with great communal areas. The dorms are clean and comfortable and the food is delicious. I felt safe the entire time and it was nice having transportation taken care of. The surfing instructors were fantastic, knowledgeable and provided 1:1 coaching. I was standing on the board within the first few days and loved watching the sun rise in the early sessions. As others mentioned, the schedule is fantastic with two surf sessions and a home cooked breakfast in the morning, followed by optional activities and time to relax by the pool in the afternoon. The yoga was a perfect post-surf activity. We went out for several meals in Cabarete and I enjoyed the company and beach-side dining. I hope to return one day and highly recommend Swell!